I'll be happy to publish wedding accounts, newspaper clippings, and wedding photos on this page. Just email your information to . This is a custom, probably of Bohemian~German origins, which was, and maybe still is, found in Minnesota and possibly other mid-western states. 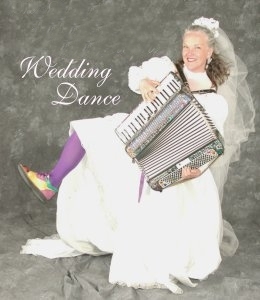 When I married in 1962, we had a wedding dance. I believe it was held in Theilman, Wabasha County, and the "Jolly Bohemians," a well-known local polka band headed up by Marvin Stoehr, played traditional "Old Time" music: polkas, waltzes and schottisches. At a wedding dance, the receipts at the door go to pay the band and a fee charged by the operator of the dance hall. Any money left over is given to the bride and groom.